Well I slept fairly normal again and got up at 7am agin. I uploaded the videos and posted them to the blog, played on the computer a little and finally got going aroung 10. I went to the Ulpan office to register for my Hebrew classes. I start on Monday since I'll be in Jerusalem on Sunday to pick up my Israeli ID card at the Nefesh b'Nefesh office. Then it was off to the post office again. This time to pay my deposit on the apartment. They do everything it seems at the post office. You pay your electric and water bills there too. In the two times I've now been there I haven't seen anyone actually mailing anything even though you have to take a number and wait your turn. 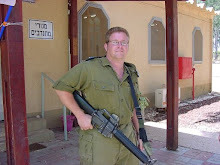 Amazingly enough the Israelis seem to wait there turn here. Then I went to the Medical building to complete the paperwork to finish enrolling in the national health care. Similar issue as at the bank, all the signs are in Hebrew and thus I didn't have a clue where to go in this 5 story building. The guard told me 1st floor. I went to the 1st floor and they were like no, no, the second floor. So, up some more stairs. 3 offices to choose from, I went into one and asked if this was the place I needed to be and they said yes. I had to take a number and only had to wait about 15 minutes to get with someone. They did the basic processing and then wanted to know if I wanted the "Gold" coverage, over and above the basic care provided by national health care. I knew I wanted it but I still asked how much and it is 43 shekels a month, just a little more than $10. But they have to draft it from my bank account. I didn't have that information with me, so she said I would have to come back. They close from 2-4 and I decided to return at 4. I headed home and stopped and bought some ice trays so I could make ice in the freezer at home, no ice maker here... I returned at 4 and completed the enrollment. I then went looking for a notebook for class on Monday. I figured I'd look in the grocery store, but alas no notebooks there. I'll find one in the morning. I came back to the apartment and sat in front of the fan for a few minutes and took a shower now I feel cool and refreshed again. I am now waiting for a friend to pick me up and we will go out. I just figured out that now that I'm in Israel the spellcheker in my blog editing tools is now spell checking in Hebrew and not my English. I will have see if I can figure out how to tell it to check my English as I know I mispell things even if it is just a typo.